The current Middelkerke casino was built in 1954, following the then-prevalent typologies of sea-side architecture. Nowadays, this building erected in the Normandy farmhouse style is a blatant anachronism that is completely out of step with modern structural norms. The building cuts the entire zone of the Epernay square, the seafront and the coastal line into fragmentary pieces and obstructs the ocean views for the surrounding buildings. The casino area forms a strategic site in the experience of Middelkerke, and it has budding opportunities that are not coming to fruition in the current situation. 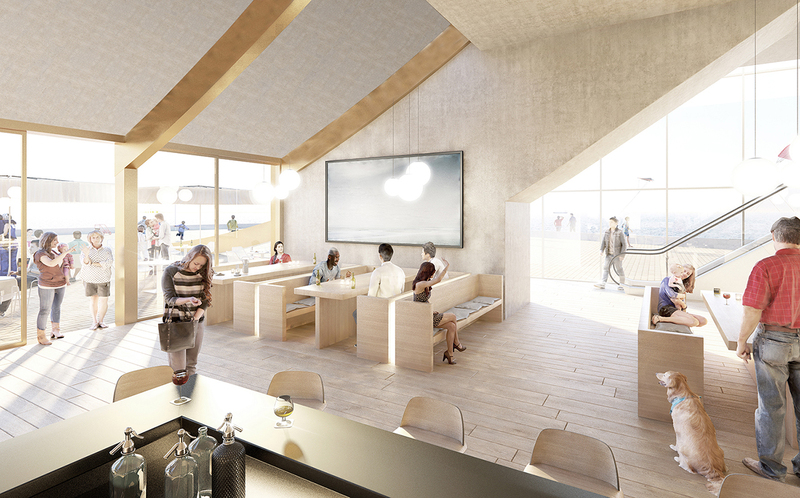 As the old casino building formed a disconnect in the bond with nature and the authentic experience of the coastal region, the new project aims to restore that relationship to the environment and nature to the greatest extent possible. 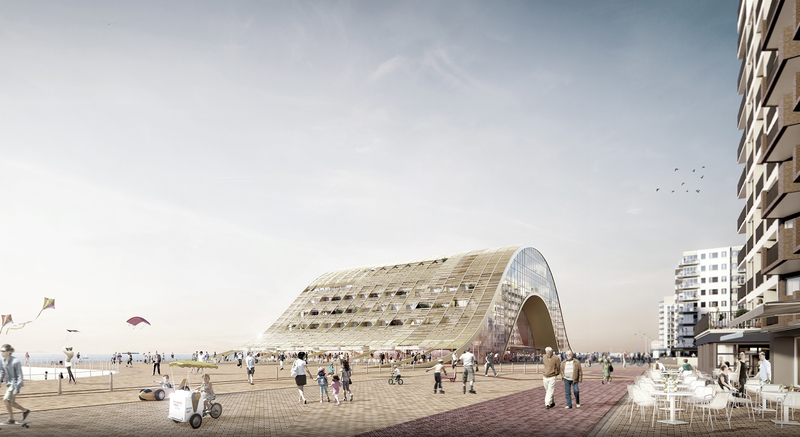 The Middelkerke municipal board asked us to design a landmark as well as a seamark. The straight, massive line of the so-called Atlantikwall’s coastal architecture requires a different kind of statement, a more organic architectural gesture. To arrive at its original design, B2Ai started from what the contemporary tourist and the Middelkerke citizen really need. While the entire project offers room for highly versatile programming, the impact of the actual volume was deliberately limited to the volume of the current casino. This landmark will become a lifeline between the Epernay square and the coast. The building will seem to have been draped across the space. This organic construction will create a 1300 m² covered space and will serve as a framing of the ocean views from the city centre. During the high season, the covered market hall will provide shade and cover from the rain. The whole space can be sealed during the less friendly months. Compared to the current structure, a lot of square meters will be returned to the public sphere. Throughout the year, the people of Middelkerke and tourists alike will be able to enjoy this space as a recreation zone for skateboarding, walking, go-carting, and the like. It will be the perfect site for Christmas markets, skating rinks, summer shows, and all kinds of other tourist and cultural activities. Along the project’s seaside, the semi-open space flows over the organic staircases into the surf. The shielded outside space will be framed by a varied programme. The enclosed, smaller, polyvalent 400 m² room (800 people standing) on the east side links up to the covered market and the existing square. All these spaces can be used autonomously or in combination with each other, thereby allowing for an incredibly wide range of different events. The ground floor area on the western side will house commercial spaces, which will engage in a strong interaction with the covered outdoor area. Levels 1-3 will be occupied by a new hotel; guests will arrive in a hotel lobby with exquisite views. 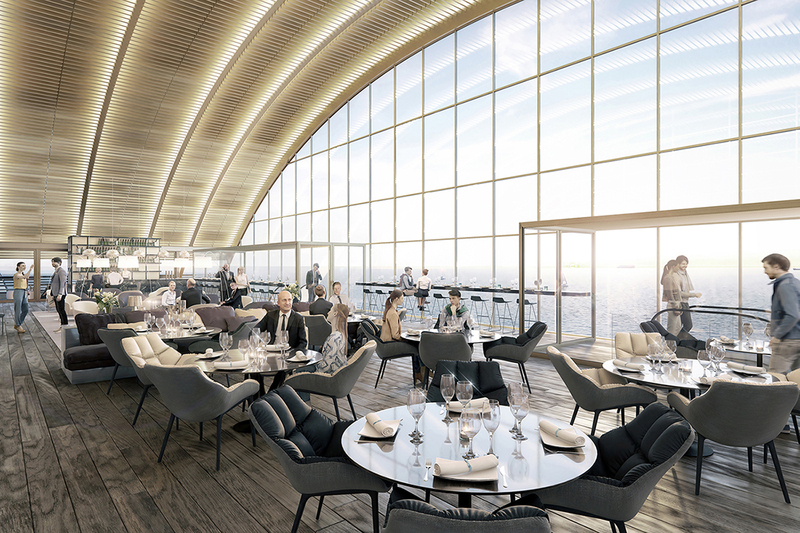 The epitome of experience will be formed by the public skybar on the very top, which can be accessed by the diagonal escalators that look out onto the sea. This level will also offer all the wining and dining the visitors to the restaurants and the casino could desire. The new ‘casino’ will be an inclusive project that can acquire broad social significance for Middelkerke and the coastal region. 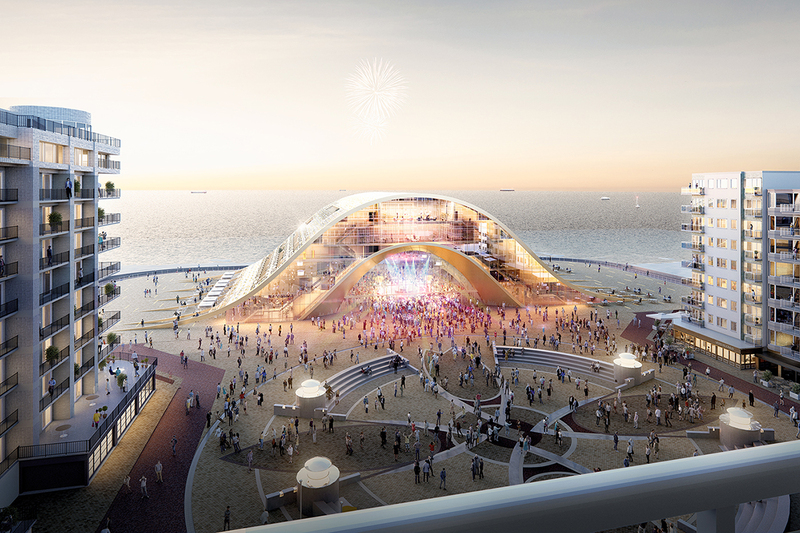 This will not be a Guggenheim on the North Sea, but a sum of all functionalities that contribute to the public and relaxing life on the coast, with art, nature and entertainment taking centre stage. The combination of an intelligent programme and a remarkable shape can put Middelkerke back on the map, in an architectural as well as a social and economic sense.